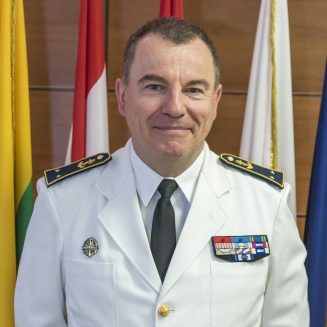 Rear Admiral Olivier Bodhuin was born on April 13rd 1962 in Diego Suarez, Madagascar. After completion of naval academy training, he served as air defense and electronic warfare officer on various types of frigates. He was engaged in the Arab-Persian gulf operations during the Iran/Iraq conflict (1988), anti-drug operations in the French West Indies (1994-1995), “Enduring Freedom Operation” in the gulf of Ormuz (2002), counter piracy operations in the Horn of Africa as Deputy Commander of the Combined Task Force 150 (2007). Graduated from the Joint War College in Paris in 1999, he was promoted Captain in 2005 and attended the NATO Defense College in Rome in 2007 (Senior Course 111). 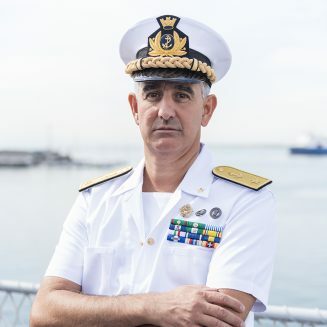 He commanded at sea on three occasions : in 1994 the Patrol ship “LA FOUGUEUSE” in Caribbean Seas, in 2002 the Command and supply ship “VAR” – flagship of the Indian Ocean, and in 2006 the Missile launcher destroyer “DUQUESNE” in Mediterranean sea. He has served at the Personnel management bureau (Directorate of navy military personnel) as “Future Plans” Head (1999/2001), and from 2004 to 2006 as “Force protection and force projection desk officer” at the Plan and Policy Division. 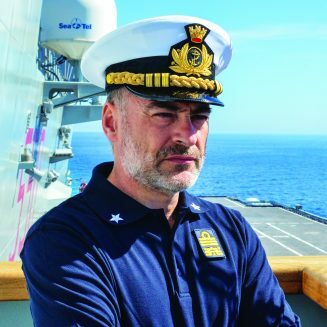 From 2008 to 2010, he was Chief of Staff of the “Standing Committee of Programs and Testing” responsible of the commissioning process of new ships, particularly the new generation of French Anti-Air Warfare Frigates, HORIZON class. In 2010, he was appointed to the Maritime Command Naples (MCNP) as N3 Divisional Head. Fully involved in the conduct of Operation Unified Protector (OUP), he also worked to the improvement of Operation Active Endeavour (OAE) and played a key role in the setting up of a unique Maritime Command in Northwood in 2012. In January 2013, he joined JFC Naples as J5 Policy Branch Head prior to return to France, at the Personnel management bureau as “Welfare bureau” Head. There, he was appointed Secretary General of the French Navy Council of Military Services and took part to its reorganization. In August 2016, he joined the General Inspectorate of the Armed Forces, as Chief of Staff of the Navy Inspector. In that position, he was also Head of the Defense Maritime Accident Investigation Office and Chairman of the National Nautical Commission and was promoted Rear Admiral on March 2nd 2018. Radm Olivier Bodhuin is “Legion of Honor” and “National Merit Order” officer, “Maritime Merit Order” knight. He has been decorated with the “Combatant Cross”, the “Overseas-Ormuz Medal”, the “National Defense Silver Medal”, the “Nation’s Recognition Medal”, the “Afghanistan Commemorative Medal” and awarded the “NATO Meritorious Service Medal”. He is married to Christelle and father of four. He enjoys geopolitics, sociology, sailing and looking after his family.